Q: How big will my Pomsky get? A: Pomskies range in size. The rule of thumb is to average the weights of the two parents. 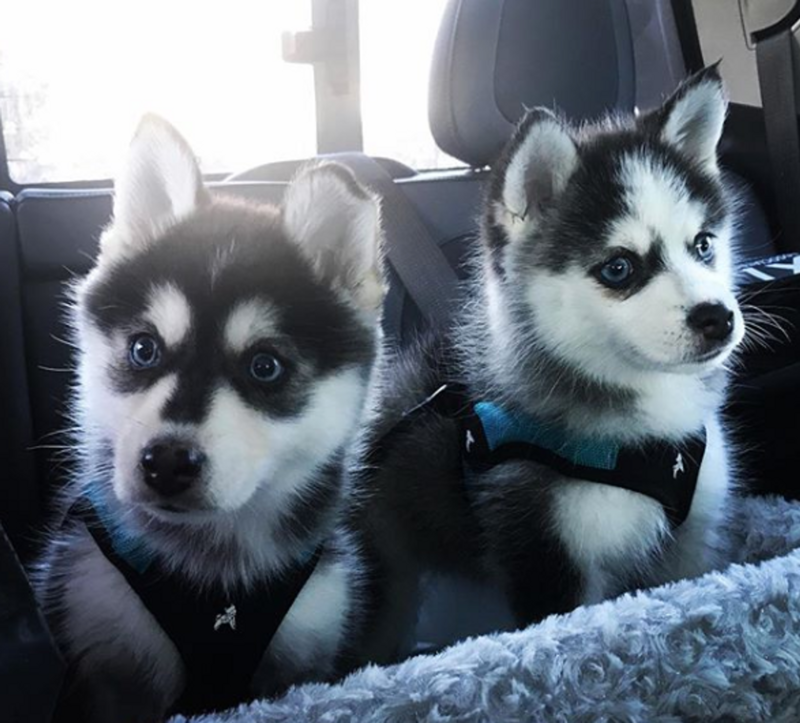 Pomskies usually range between 15 and 25 pounds. Q: How much does a Pomsky cost? A: Our prices range from around $2500-$4500 depending on size, eye color, markings, and coat. This means that we cannot guarantee a puppy will cost $2000. A small black and white pomsky with two blue eyes will be your most expensive puppy. Q: What does the price of a puppy include? A: Puppies will be routinely vet checked. All puppies will be up to date on wormings and vaccinations when they go home. Their price also includes a microchip, toys, harness, leash, two weeks of food, and a blanket with the mother's scent. The blanket gives them a familiar scent to help calm them in their new home. Q: Why are Pomskies so expensive? A: Pomskies are high is price due to the high cost and time it takes to breed them. The parents we have chosen have cost us thousands of dollars to purchase. We then take them for routine vet check ups to ensure that they are kept very healthy. The actual artificial breeding is also incredibly expensive. Before we are even able to inseminate the female we have to have numerous blood tests done to measure her progesterone levels. Each test costs hundreds of dollars. The insemination costs thousands of dollars. Every failed pregnancy results in a very large loss of money and time. In order to breed these dogs you have to have a lot of money going into it and a whole lot of patience. We had to wait 2 years to even try our first litter. We will not lower the price if you cannot afford it. Dogs are very expensive pets, so if you cannot afford the cost you cannot afford to give it proper care. Q: How can I be added to your wait-list? A: Send an email to pristinepomskies@gmail.com with your name, city, state, phone number and email. I will be in touch when we have a confirmed pregnancy to conduct adoption interviews and collect $500 deposits. Once the puppies are 5 weeks old we will allow people to begin choosing their puppy. If you are uninterested in the puppies in your first litter you are able to "pass" to have the opportunity to pick from the next litter. We offer up to two passes. After that your deposit will expire and will not be refunded. Once a puppy is chosen it must be paid in full. If the puppy is not paid in full by 8 weeks of age you will have to pass on the puppy. Q: Why should you adopt a puppy raised indoors? A: Puppies raised indoors are proven to have better social skills and are easier to train. When a puppy is raised inside it is used to hearing loud noises like pots and pans, slamming cabinets, dishes, etc. A dog that is raised in a kennel and brought inside will be scared of these noises and will take a long time to adjust to a home. A: Yes and no. We prefer our buyers to travel here and pick up the puppy. We will meet you at the airport if you are flying in. The puppy will fly back with you as a carry on. This way we can still meet you. In rare cases will will fly out and deliver the puppy to you for an additional fee. Q: How do you breed a Pomsky? A: The breedings are done using artificial insemination. Natural breedings are virtually impossible due to the size difference and could be dangerous for the male. The males should always be a Pomeranian while the female is a Husky. Q: Can I breed my Pomsky? A: No. Our contract contains a requirement of spay/neuther within the dogs first 7 months of age. Proof of the spay/neuter is required by this time and if it is not provided, you will be in breech of the contract. If the contract is breeched we will prosecute you to the full extent of the law. This could result in your return of the puppy with no money back. If surgery needs to be delayed due to the health of the puppy, proof from a vet is required as well as their contact information. We do not want our breed ending up in the pound so we take full responsibility of every dog we produce. If you are unable to keep your dog we require that you return the dog back to us.